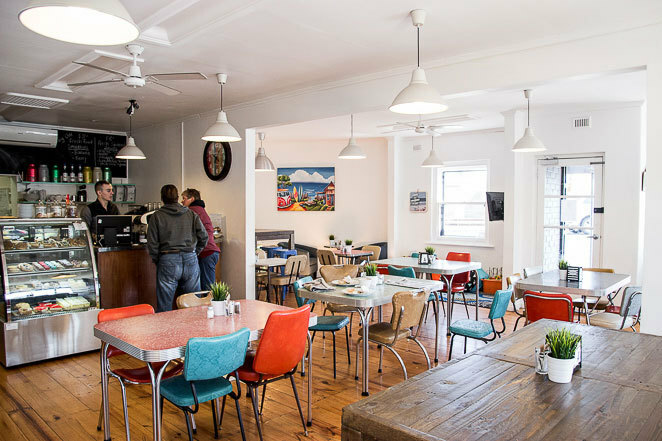 Semaphore may be a busy strip come brunch time, but there aren't too many spots within walking distance for locals in Largs to satisfy their coffee addictions. 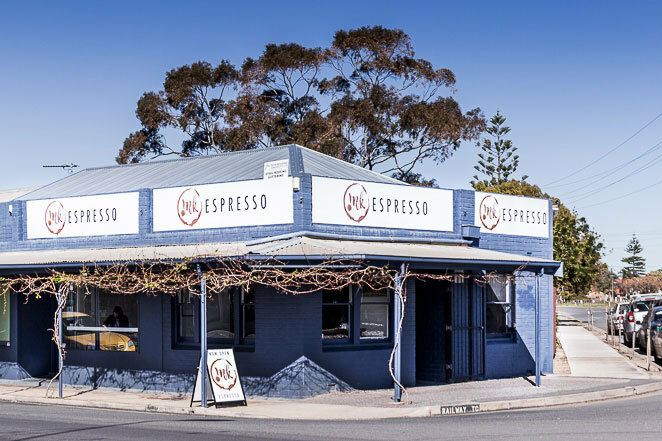 Lucky for us, Ink Espresso has now landed on the corner of Fletcher Road and Railway Terrace, filling the shoes of previous cafe Rockefeller. 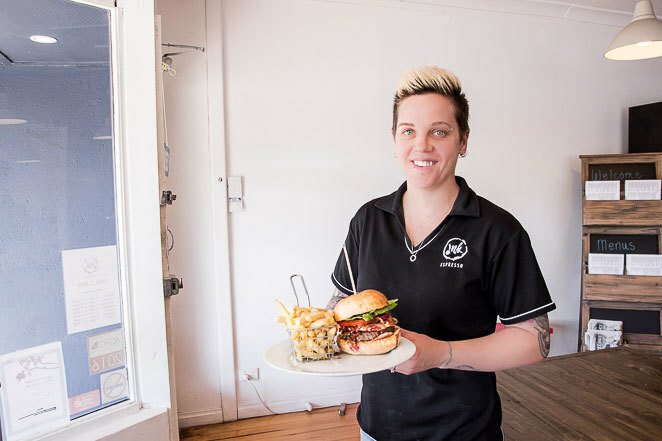 New owners Dani and Carly have imbued the space with a brand new energy, creating a super comfy spot to sip, munch and relax. 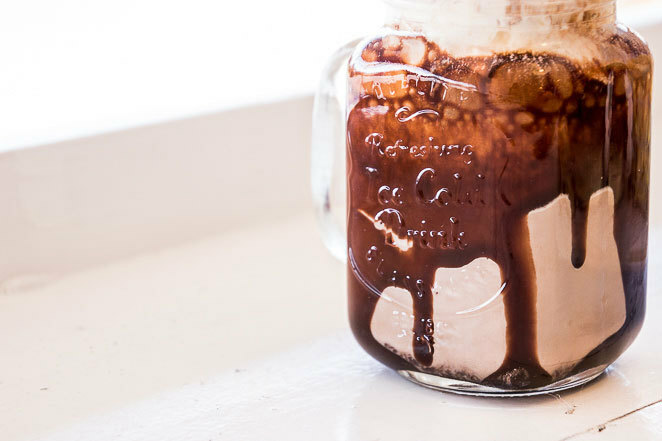 Why not top off your burger with a ice cold chocolate milkshake? And it seems the locals know they're on to a good thing too. Especially on Saturday and Sunday mornings, when the café teems with people catching up with friends over a hot cup or three. Thankfully there's plenty of seating inside at the quirky retro tables, tall benches and stools, and soft, comfy couches. 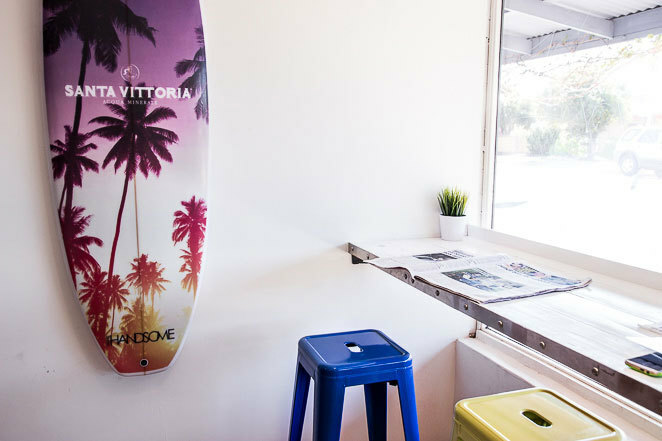 Sit and read the paper in the morning sun with mugaccino of Vittoria coffee. 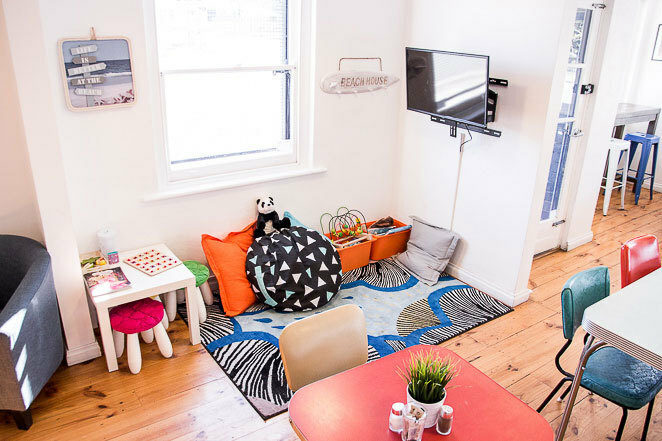 Mums and dads no doubt appreciate the chance for a coffee date while the kids can play in a cute space packed with toys and a TV. Topping it all off, the whole space has a bright, clean and beachy feel with huge windows to take advantage of natural light. The kids corner is a great addition so you can chat and relax. It's clear these guys love the local scene and being part of the community as you can see on their Facebook page. 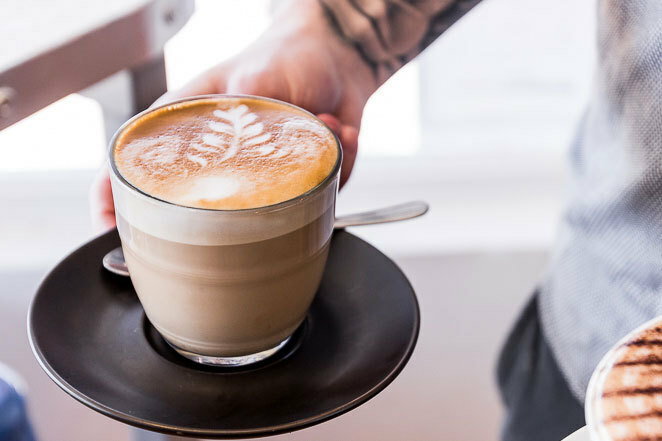 From cafés to bakeries, bars to pubs, the owners and staff have years of hospitality experience between them and really know how to look after their customers. Their up-beat conversations and in-jokes with regulars only added to the ambience as we picked our spot and grabbed a menu. Pop in and say hi to the ever lovely Dani - Ink Espresso's super cool owner. Now there are plenty of options to choose from on the menu and vegetarians, vegans and gluten-free diets are all covered. We asked for the most popular item to see what everyone's talking about, and scored the towering Beef Burger served on a Turkish burger bun. It's a little firmer than your average bun, making it much easier to get a good grip. 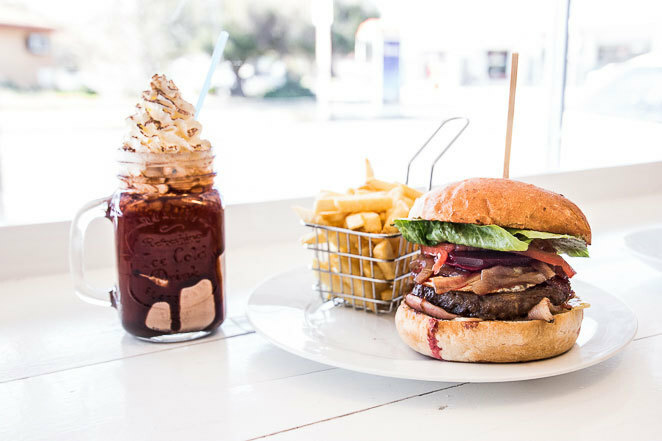 And that's a very good thing, because the burger packs layers of beef patty, crispy bacon, perfectly fried egg, caramelised balsamic onion, beetroot, tomato, lettuce and sauce. 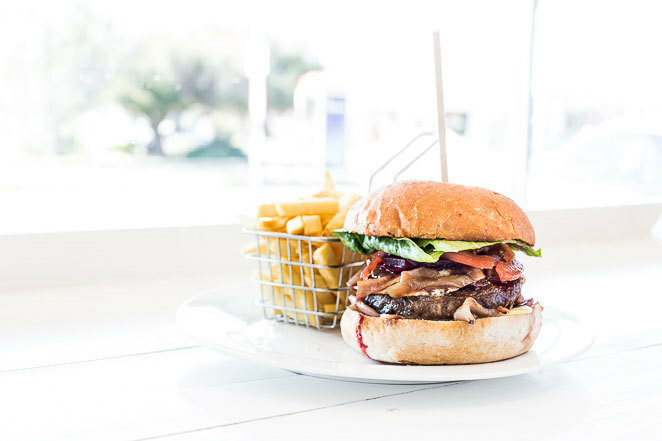 Two of us shared the burger and chips and were more than satisfied - so we're pretty sure no one will be leaving Ink Espresso hungry. With burgers like this, you won't need another meal for days. Dani told us that while hearty soups have been keeping people warm through winter, she plans to tweak the menu in summer to cool us off with refreshing salads and healthy wraps. One thing that won't be changing is the mouth-watering veggie breakfast equation of free-range eggs, grilled tomato, sautéed mushrooms, baby spinach and pine nuts, baked beans and sourdough. Latte perfection. Just look at those layers! To wash it all down we ordered a latte and impressively huge mugachino, both served hot and creamy. Made with Vittoria beans, you can order it any way you like and mix it up with dairy, soy, almond, coconut or zymill milks. After that, a luscious chocolate milkshake with piles of cream and lashings of chocolate sauce meant we had no room left for dessert. 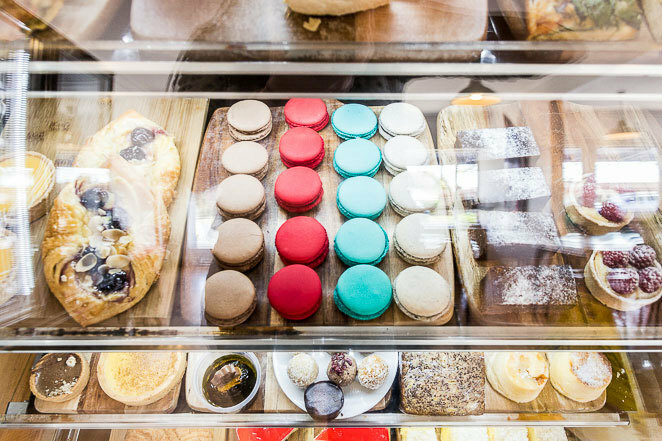 Sadly, we missed out on Dani's homemade vanilla slice or a sweet raspberry tart from Mayfair Bakery, so they are definitely on our list for the next visit. Sweet treats are all from local suppliers in the area - homemade and incredibly delicious! For those that appreciate a healthy sip you can choose from a list of freshly made juices or make up your own creation - that is, if you can tear yourself away from a banana, berry or tropical smoothie. Either way, Ink's interior is perfect to sit around and chill for brunch. Ink Espresso is conveniently open 7 days - from 6.30 am on weekdays for your pre-work coffee and breakfast run and from 7.00am on weekends - so there's equal opportunity for early risers and those that love a good sleep in to get their fix. Ink Espresso Cafe at Largs North. While there's no dedicated carpark nearby there is a decent amount of street parking, and Largs North train station is right across the road. 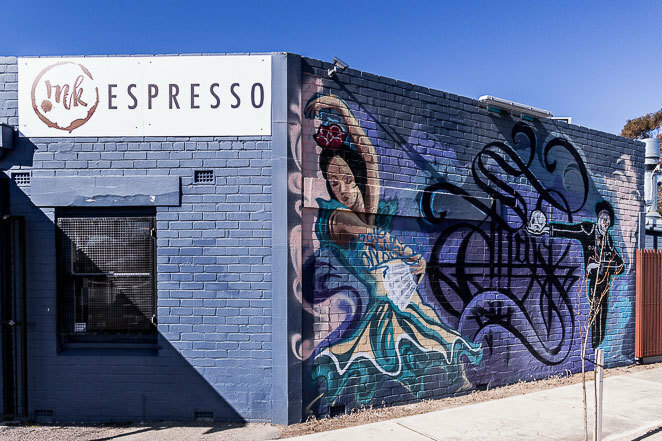 Ink Espresso's awesome mural is a definite eye-catcher. Why? Mugachinos & Burgers just a 5 minute walk from the beach. One to add to the list of coffee stops (which might be a milkshake). Thanks Laura. Lovely little kids area too.